One is a linchpin of the global financial system, the other represents a bet that the system is ripe for a revolution. Which is the better buy between the Bitcoin Investment Trust and U.S. Treasury bills? Bitcoin Investment Trust (NASDAQOTH:GBTC) vs. Treasury bills -- which is the better buy? Bitcoin is a highly volatile digital currency that is backed by no government, and will revolutionize the financial system, according to its ardent proponents. T-bills, short-term debt backed by the full faith and credit of the United States government, are a pillar of the established financial system -- arguably the ultimate risk-free asset. The two assets are so dissimilar, the question might strike you as absurd, but stay with me and I think you'll find the contrast instructive. 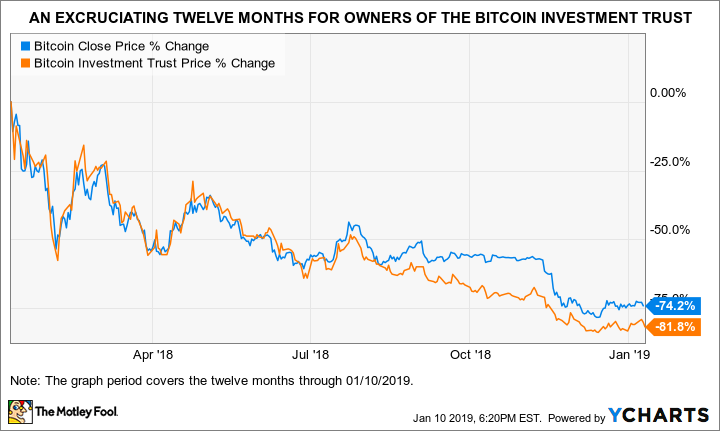 Bitcoin Investment Trust, which I'll refer to below by its ticker, GBTC, is an open-ended investment trust with an objective to reflect the price and performance of Bitcoin, minus fees (at 2% annually, these are significant, particularly for an index fund). GBTC invests only in bitcoins; when you purchase one share of the trust, you become the owner of 0.00098895 bitcoin (as of the end of December). Note that this fraction must decline over time, as the trust will regularly sell some of its holdings in order to pay itself its 2% "sponsor's fee." There are risks and advantages specific to investing in GBTC rather than purchasing bitcoins directly, but the investment case for GBTC largely comes down to the case for or against buying bitcoin. And this is where we run into an intractable problem, so I had to take some liberty in using the term "investment" in the previous sentence. Bitcoin has no fundamentals. Unlike stocks or bonds, Bitcoin does not confer on its owner any legal claim on specific assets or cashflows. Unlike gold, Bitcoin has no non-financial "use case," to use the expression of the day (one might be tempted to call it use-less). In fact, the only genuine use case to speak of for Bitcoin -- financial or otherwise -- is as an instrument for unbridled speculation. The value of a bitcoin can only be established with regard the price buyers are willing to pay for it at any given time: It has no intrinsic value. Zero. That's a pretty serious problem for an investor who owns or is considering buying bitcoins because it means that any price above zero is ultimately sustainable. Bitcoin evangelists can deliver impressive-sounding rationales for owning digital tokens, but when it comes down to it, there is only one buy case for Bitcoin: I think I'll be able to find someone with less financial acuity who will pay me more (in dollars, mind you!) for this digital token than I paid for it. Bitcoin's performance over the past twelve months has been miserable and GBTC has underperformed that, with a loss of more than four-fifths of its value (see graph below). However, in light of what I have written above, an eventual total loss is likely, assuming the fund's manager doesn't close the fund and return investors' money first. T-bills represent a legal claim to a fixed cashflow, which gives them an intrinsic worth. The cashflow, which represents the return of the principal and the interest, is certain (T-bills are sold at a discount to their par value; investors receive the par value once the bill matures). Admittedly, I don't think T-bills are a terrific option. Historically, they've barely kept ahead of inflation: Over the ninety-year period through 2018, 3-month T-bills have returned 3.35% on an annualized, roughly one third of a percentage point ahead of the U.S. Consumer Price Index. Not to mention that current rates are low by historical standards, the current yield on the 3-month T-bill is 2.42%, according to data from Bloomberg. Still, there is something to be said for safety of principal -- and on an inflation-adjusted basis, no less -- particularly when compared to an asset that puts your principal at real peril. "Our willingness to hold cash at times when great opportunities are scarce allows us to take advantage of opportunity amid turmoil that could handcuff a competitor who is always fully invested." The recent stock market declines breathe meaning into these words; there were certainly attractively priced stocks on offer during this period... to those with the cash on hand to seize them. What a world of difference between putting your money in an instrument that is safe and provides you with optionality and tethering oneself to an "asset" that is destined to go to zero. As the air has begun to come out of the cryptocurrency bubble, investors are (re-)learning this simple lesson, but it'll be even more obvious twelve months from now.